So by now, we have all heard about these new gel manicures that apply like a polish and lasts for days and days and days....you get the idea. But with so many new lines popping up, how do you choose? A personal favorite is the Gelish line. Aside from being easy to apply, remove, and standing up to all the rigors of my insane life, Gelish offers an absolutely amazing range of colors....which is set to increase by 24 at the end of this month - making the line a full 72 colors! The new 24-color line will be ready to ship by the first week in February, and is currently available for pre-sale. This line rounds out the already amazing line of colors. There are some more really trendy glitter colors, including High Voltage which is a gorgeous deep pink glitter. It just screams Summer Pedicure, and has me dreaming of those summer nights.... As companions to the trendy glitters, there is Medieval Madness, a gunmetal gray, and Up in the Blue, a fun sky blue - perfect for those trendsetters strutting into your salon! The line also features some gorgeous dark colors perfect for winter, including Plum and Done, a deep and dark plum; Hot Rod Red, a candy apple red; and Black Cherry Berry, a beautiful dark cherry red. In addition to all the fun and funky colors Gelish is offering, there are some new whites for French Manicures, as well as some more pretty, pale sheers. Combined with some pearly and bright pinks, the new Gelish color line can stand on its own as a perfect selection for ALL of your clients. 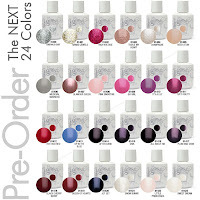 If you are dying to add some more Gelish colors to your selection, you can pre-order them here, and Pure Spa Direct will automatically ship them to you as soon as they are available. If you are new to Gelish, these new colors add a fun twist to the colors already available, and is a great place to start with this amazing new product!